I’ve started on my quest to cover the apartment in doll quilts. Tiny tiny squares. Well ok 2" isn’t that tiny but tiny enough for me. I can’t decide if they want to be arranged symmetrically or just jumbled up. I’m thinking the latter. And maybe whipstitching them together instead of sewing them in the machine. Maybe while watching some netflix that have been sitting on top of the tv for about a month now. If you ever wonder how does netflix make any money. Us, it’s us. Just got off the horn with the printers and looks like middle of next week for embroidery patterns. We’re having postcards made up of the girls and one of each will be included in the set. I can’t wait to see how they turn out! And rockin bunny is on her way too. I think I’ll go ahead and be offline until next week then. Miss Maggie is a week past her arrival date and is coming out in the next few days whether she likes it or not! I fund Netflix, too! So sad, when they include the envelopes and everything. Enjoy your blog vacation and the arrival of your neice (so exciting)! I’m very excited about the embroidery patterns, they seem like a great summer project. Your doll quilts look great! Congrats to your sister! Make sure she gets the good drugs. Of course, line me up for the embroidery patterns! Love the idea of the doll quilt montage. I got the uncut three little pigs doll pattern in the mail from ebay today. It’s huge. I think I will make it into a curtain for daughter’s room. PS – Stuffed kitty #2 and she held! I just have to decorate her and she’ll be up on Flickr. I have been making a million little 2″ squares as well. Not for doll quilts, but for a patchwork Octopus. Found an old pattern-so excited. Enjoy the break! Can’t wait to see the finished doll quilt! I love the fabrics you chose! I think it is a great idea. Can’t wait for the embroidery patterns! Oooh, I can’t wait to see that quilt come together. Turquoise and red are two of my favorite color combinations. Lovely! Ohh, your doll quilt wall post totally inspired me on the doll quilts and I’ve had them on the brain too. I’m thinking if I make one every 2 weeks I’ll be all set in no time. Love the fabrics you’ve picked; I vote for random squares (all jumbled up). Enjoy the new niece! WooHoo! Babies, patterns, postcards, and quilts! Have you got the “Little Quilts All Through The House” book? It’s one of my favorites. Little Quilts shop also happens to be about 20 minutes from my house and it’s always great for inspiration. Thanks for everything! Yeah, I’m a big part of Netflix’s success, at least during baseball season when I keep paying my subscription but go from watching a dozen dvds in a month to four. Oh well. I love the doll quilt too. I’m working on a baby quilt with that my sister did some embroidery squares of bunnies and I’m adding to it for our cousins wife. I’ll post the picture when I’m done. I just visited your gorgious toys album and i would like to know if there is a store where i could command ones of these wonderful creations ? I love this quilt. I can not wait to see it finished and ooh next week? I can not wait!!! Yay! I look forward to your return! No, I am funding Netflix. Last week I finally watched a movie from Netflix that I had had since mid-DECEMBER. Can I ask what printer you’ve been using for your booklets/cards? another netflixie here. you’re reminding me of the 3 waiting to be watched on my coffee table. ahh. love the colors of your doll quilt. i can tell it’s gonna look fabulous. enjoy the blog break. I love it. I think I have that red polka-dot pattern in blue! I was that Netflix customer, too–those movies would sit and sit and sit and I felt so guilty every time I looked at them. I solved the problem by quitting Netflix, but I miss their wonderful, unusual assortment of stuff. Cannot wait for the embroidery booklet. Congrats on becoming an auntie soon! That is going to be awesome! It’s looking great – can’t wait to see more. And yay for Miss Maggie – I hope everything goes smoothly. Fell in love with vintage doll quilts after your post and bought one off ebay – got it last night and it reeks of cigarette smoke. so sad! Much better idea to make your own! horray for doll quilts! and I have done that strip meathod before that stephhung suggested and it’s da bomb-I’d do it by hand, or the strip way by machine. . if it’s not too late. . .
.and the colors are so sweet!! hugs to you sis-so very exciting! as are the goodies from the printers-can’t wait! “A is Adorable…” love these tiny squares. good job. You’re making me want to quilt again..
Those colors look great- you are very talented. I am new to sewing/quilting and to get going, my mother and I are going to make a bunch of the Wee Bunnies for all the wee people wee know : ) I just had one question, what is “weighted stuffing”? I asked today at the craft shop and they had no idea what I was looking for…is it available or do I have to be creative with like beans or something for weight??? What is this… little quilts? What is this.. your freakin’ amazing site? WHy is this the first time I’ve been here? I’m so in love. Everything is so vibrant and sweet. *sigh* I’d love to see what your house is decorated like! 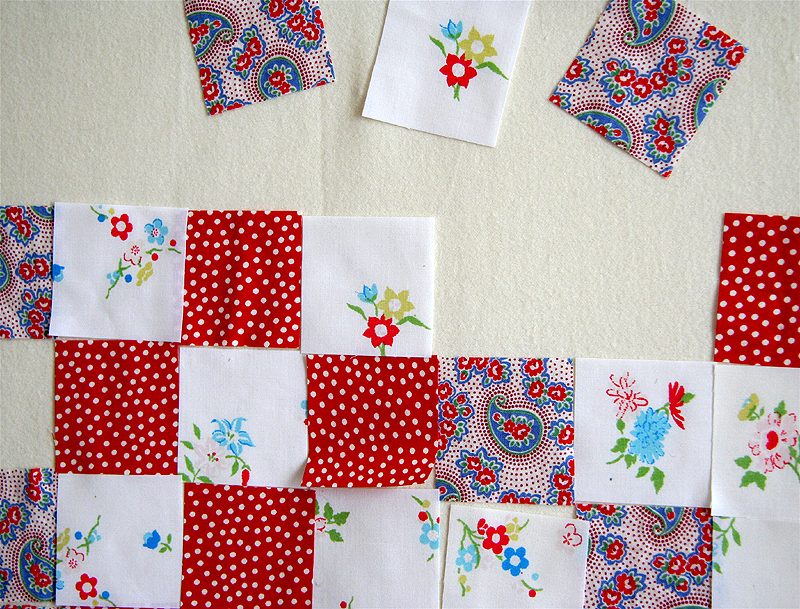 mini quilts! love it. It’s about the level of quiltmaking I might manage. Small projects, over quickly. And for me the cuteness might override the badly-made-ness! Escuse me “Hillary”. I was thinking about a quilt patterns I have named Heather & typed in the wrong name. Ooops. This will be a cute 9-patch doll quilt. I think the polka dot is a charming accent. What a sweet idea for a lonely piece of wall.